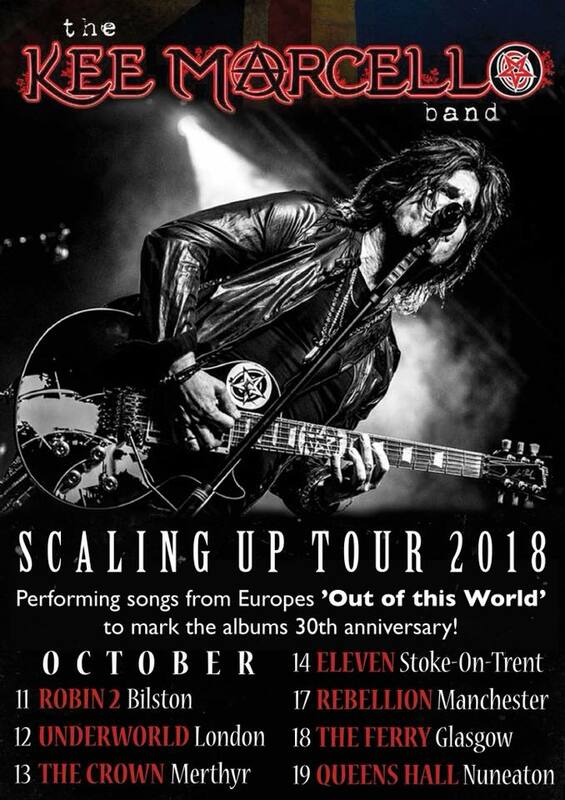 Swedish guitarist and vocalist Kee Marcello – best known for his time with multi-platinum selling band Europe – hits the road in the UK for his 7 date SCALING UP TOUR in October! The set will feature songs from the Europe album Out of This World, which celebrates it’s 30th Anniversary this year, as well as solo material and tracks from Kee’s current album, Scaling Up. Marcello is best known for his years with multi-platinum selling band EUROPE, whose mega-hit “The Final Countdown” went to number 1 in 25 countries. These dates form part of Marcello’s ‘Scaling Up’ tour, which supports his latest album of the same name, and marks his return to the melodic hard rock genre. Fans of Europe will be familiar with Le Baron Boys – a pseudonym Europe used during a now legendary time when the band were working on follow up material to their hit album Out Of This World – and Kee will perform material from this era on the tour, some of which also features on his latest album. Kee’s latest release, Scaling Up, represents his vision of the path he and Europe would have gone down if they had continued with the Le Baron Boys material. This year also marks the 30th Anniversary of Europe’s Out Of This World album and to celebrate, Kee and the band will be performing a selection of songs from the album, some of which haven’t been performed live since Europe’s OOTW tour back in 1988! The Kee Marcello Band includes long-time collaborator Ken Sandin (Alien, Joe lyn-turner, Rock Legends, Eric Martin) and Tim Brown (Don Airey, Martin Turner ex-Wishbone Ash, Aynsley Lister). BIGFOOT Release Lyric Video For “Uninvited”, Announce New Singer + Tour Dates! Melodic Metal Heroes Coldspell Return With New Album & New Single! Stoke up the fondue....it's cheesy ROCK time!